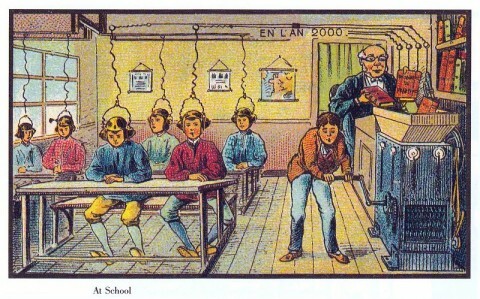 The terrifying thing is, this picture was created by French artists about 100 years ago as they tried to predict what education in the year 2000 would look like. It’s fascinating to think about why artists at this time would think of this as a utopian view of education in the future. I’m more interested in diving into the implications for today. Three main things concern me about this photo: The single old white guy selecting content for the machine, the clear uniformity of his students in terms of race and gender, and the massive focus on content delivery instead of experiential learning. In a lot of ways, this picture depicts what concerns me most about the future of MOOCs, online learning, and other current trends in educational technology. The same mindset that created the image above is what currently dominates public education. Major decisions are being made by out-of-touch leaders in education that seem to only benefit a small part of our population. Those same decisions are also perpetuating the idea that a good education is nothing more than efficient content delivery. As a result, we have system with massive achievement and opportunity gaps. While high socioeconomic status students have access to schools and extra resources to supplement their content-riden education with authentic experience, our students in low SES communities are left behind. I fear that current trends in education innovations are only perpetuating this gap and not considering how public education as a whole needs to shift. I believe we need to start using innovation to challenge the ideas that this 100-year-old picture represents. Our students deserve a system that gives them a voice in what content is important for them, allows for adaptation to diverse audiences, and emphasizes experiences and performances of understanding over content digestion and regurgitation. We need to not just think about how to bring education to a large scale, but how to bring the right type of education to scale. I kicked off this week’s T509 prep with Anant Agarwal’s TED Talk on MOOCS and blended learning. Towards the end of the clip, he calls the audience to take a moment to dream about education in the future. He mentions that he can imagine a world where a college campus has only one lecture hall simply standing as a reminder to our grandchildren that we used to learn by sitting in a room and listening to a single lecturer without the convenience of a rewind button. This all comes after a discussion on how content created through MOOC production is revolutionizing the way we can think about blended learning. He points out key features such as videos capturing great teachers explaining complex topics and interactive assessments providing instant feedback and personalized learning. While listening to him discuss a future of blended learning, I had to stop for a second and think about my own vision for my grandchildren’s education. What would I want education of the future to look like and how do MOOCs influence that future? In my T600 Class: Thinking and Learning Today and Tomorrow, we have been working on applying research ideas from Project Zero to thinking about what good education looks like. I do not think that at any time one of my classmates has brought up that what educators need are really good lectures or self-graded assessments. We have spent a lot of time, however, discussing how to create student-centered performances of understanding that guide learning and make it visible to students and teachers. When I was teaching, I established a practice of having my students write letters to my future students as soon as they finished their final exam. The assignment was for them to give that student advice and let them know what to expect in my class. I always loved diving into reading these letters so that I could reflect on my practice from that year and get a glimpse of what my students thought about my class. Not once did a student ever write anything like “His lectures are amazing” or “His quizzes really make me think.” Instead I would read things like “He helped me understand that math is everywhere” or “I now know that math is used all the time in the real world.” These types of responses did not emerge because I was really good at talking and writing good tests, but because I was focused on creating projects for my students that helped them learn math through application and reflection. In thinking about the content of MOOCs (specifically xMOOCs), I can only think of two key elements: short video lectures and some form of automatically graded assessment for instant feedback. All of these features tools for scaling pretty standard education practices in education today: lectures and assessments. By scaling these practices, are we really transforming education? In my experiences, absolutely not. I believe that teaching and learning worth scaling are practices that encourage students to experience authentic projects and engage with material in individual ways. MOOCs in their current form are simply translating old practices to a new medium, not changing the same education practices that have led to major calls for reform. In this week’s readings, I was inspired by a few key efforts to scale education that align with my vision of experiential learning. I was impressed with the New York Times article on how Harvard Business School is approaching online learning. Instead of jumping on the bandwagon of posting video lectures, Business School leaders went about thinking how they could recreate their case study based teaching and class cold calling into online learning. On page 15 of the Institute –wide Task Force on the Future of MIT Education: Final Report, recommendations are given to MITx to think about ways to bring problem-based learning strategies to scale. One incredible idea given as an example involved creating a series of MITx courses around air pollution to bring MOOC learners together around developing solutions in their communities. These two examples captured for me what I think excellent learning at scale should look like. When it comes to transforming education, I think many MOOCs are currently only thinking about a small part of the problem. They are providing education and creating content at a large scale, but is it the type of education and content we should be scaling? In future blended learning classrooms, it would break my heart to see students simply sitting around watching videos and taking assessments to show mastery. I would want to see my grandchildren in an education system where they are engaged in meaningful projects and showing mastery through performance, not regurgitation. When it comes to making that system a reality, I think MOOC advocates should be thinking less about how to better scale presenting and assessing content. Instead, we should be thinking about how to scale practices that foster authenticity and engagement in learning. It took me a little longer than usual to think of what I wanted to write about this week for T509. This week’s readings took us on a deep dive into the MOOC production process and we had several HarvardX and edX folks come and speak to our class about what it’s like to work with faculty to produce one of these online learning experiences. Going into the class, I had one key question. According to The Chronicle of Higher Education article, MOOCs have shown very little success in terms of outcomes for students and MOOC professors seem fairly split on whether or not their courses will ever actually be recognized for credit at major institutions. Yet, the vast majority of MOOC professors reported that they believe MOOCs are “worth the hype.” I couldn’t help by wonder: If MOOCs do not seem to hold much promise in progressing student outcomes and lowering barriers to higher education, why in the world do MOOC professors think they are so awesome? Reach – To increase the number of people who have access to courses by prestigious Harvard faculty beyond campus and the USA. Research – Each MOOC course generates potentially millions of data points about online learning that can help uncover answers to big questions about new education trends. Recirculation – Professors who make MOOCs take their key learnings and new media resources back to their normal “residential” classes to improve teaching in learning on campus. 1. The MOOC design process requires professors to think deeply about course design. Annie discussed with us how professors at HarvardX have to go through a rigorous process to outline their course and think about pedagogy before HarvardX will start making their course a reality. She found that when first asking professors what their learning goals were for the course and how they would measure learner outcomes, many of them responded with a blank stare. This was the first time for many of these professors in the decades they had been teaching that they were asked to stop and be purposeful about what they were teaching and what they wanted students to learn. Not only that, but Annie also mentioned that professors were constantly referred back to those goals and outcomes when making small decisions in the process (such as what questions to ask or what to include in a short video). 2. MOOC professors had the opportunity to work with an diverse interdisciplinary team with innovative resources to make their course a reality. HarvardX’s team includes software engineers, media producers, film editors, a talent coaches, and many other skill sets to make a professor’s vision come to life. With this access, a professor actually has a powerful team and set of resources to use to find innovative ways to present materials and measure student outcomes. They are also supported through the whole process by individuals from various backgrounds to constantly present new ideas and give feedback on course choices. 3. MOOC professors are designing for a way of learning that they know very little about. Every teacher at one point has been a student in a classroom, but a much smaller number have ever been a student in an online course with multiple thousands of classmates. When designing their courses, MOOC professors are thinking about reaching and retaining an audience of learners that they are really unfamiliar with. It’s amazing to me how such a small shift suddenly leads to choices such as “videos can only be about 10 minutes long” and “we need to include constant formative assessment to see how they’re doing.” In reality, those teaching choices are not much different than good practices that are frequently ignored in traditional classrooms. It’s interesting that, by simply making the audience seem unfamiliar, it becomes easier to adopt teaching practices that seem so heavily resisted in familiar environments. These are only a few of the theories flying around my head, but this brings me to the title of this post: every teacher should make a MOOC. Now, clearly I’m not really saying that all teachers in the world should go out and haphazardly attempt to make a class to educate thousands of learners. There is something going on here, however, that I do not think educators should ignore. When thinking about issues in our current education system, both higher education and K-12, teacher quality is something that comes up time and time again. As a young teacher myself, I constantly struggle with finding ways to improve my teaching and turn my classroom into a place where deep learning is happening. It sounds to me that making a MOOC would be an amazing way for me to develop my teaching skills. I would love the opportunity to work with a diverse team to develop a course I care about from start to finish and deeply think about how my choices affect student outcomes. I would love to team up with media specialists to create videos and animations that bring learning to life in the classroom and create learning experiences through technology. Most of all, I would love to launch my course ideas and see how they work with a “massive” audience. In a way, that massive size of the audience and the nature of MOOCs would make the whole experience fairly low-stakes. If my course stinks, none of my learners would not really miss out on anything since MOOC completion currently counts for very little and now I would have a platform to rethink teaching for a more high-stakes audience. In the process, I would have learned a ton about what innovative teaching practices look like so I can apply them to my classroom practice. In reality, these elements of deep thinking about course design, interdisciplinary collaboration, and an unfamiliar low-stakes audience seems like an ideal recipe for an amazing teacher preparation course. These ideas have me thinking not about how MOOCs may change the educational landscape for students, but how they can change it for teachers. I’ll admit, the idea of scaling the creation of massive education is slightly absurd, but I do think there is something we can learn from MOOC production about how we can start improving teacher quality. Aside from my small theories developed during my morning T ride, it would be interesting to really take a look at what happens during MOOC production that results in big changes in teacher mindsets about teaching and learning. We should take advantage of the current hype around MOOCs to answer a new question: how do we scale a teacher’s experience of scaling education?